The countdown has started to the first edition of the 12H Cycling Marathon taking place on June 27 and 28 2015 in the Autodromo Nazionale di Monza, the famous race track steeped in history. Dedicated to all cycling enthusiast, their families or simply bicycle lovers, this two-day race takes place from 10.00 a.m. on Saturday 27 to 6:00 p.m. on Sunday 28. In a night race where the athletes will face their personal challenge in complete safety, either alone or as a team, the brave participants will pedal non-stop from dusk till dawn for 12 hours, in an event that will provide its share of unique emotions. The Cycling Open Days are not only a race. Besides the 12H race, there will be an “experiential” Bike Village with on-track Bike Tests and Workshops on sports nutrition, training methods and road safety. This unique and passionate event will also keep the kids entertained, thanks to the Kids Area and to the Junior Bike Test on a mini circuit. The 12H Cycling Marathon is the brainchild of Andrea Massimello, its creator together with the Night Riders Cycling Team, combining commitment and energy, it is a bike marathon with a double vocation: bold and heroic spirit on one side, exciting and all-involving on the other. It is open to both pro-riders and amateurs who will ride freely at their personal pace. It is possible to take part in this pedaling adventure, alone or as a team consisting of 2, 4 or 8 people (men, women or mixed), sharing the experience with friends. For those “obsessed” with single speed bicycles, they can race with fixed gear cycles that will be scored in a specific list. But this is not all! Thanks to the partnership with Bike Channel / Sky 214, Radio DeeJay and to the enthusiasm of Linus and Aldo Rock, all raring to start right now, the Autodromo di Monza will be a mix of competition, emotion and fun. For rules and information, go to www.cyclingmarathon.com. Ambrosio, Gore, Kappa, Kuota, Lauretana, Lavazza, Red Bull, Specialized and Vittoria are the primary sponsors the 12H Cycling Marathon. This event will let you pedal in a fascinating environment, at night, with only your own helmet light and the full moon to guide you. Athletes will pedal without traffic and in total safety focusing only on their effort, pushing their physical and mental limits in search of an experience that they have never reached before. Come, join us and challenge yourself and your friends in the night between June 27 and 28 in Monza. 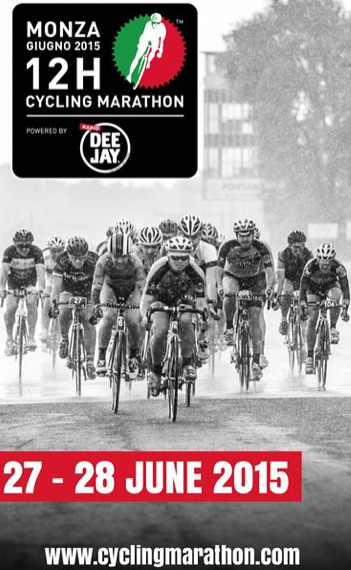 The 12H Cycling Marathon: this time the engine is you!